Limiting global warming to 1.50C would require rapid, far-reaching and unprecedented changes in all aspects of society, according to the latest report from the world's leading body of climate change experts. Limiting global warming to 1.50C would require rapid, far-reaching and unprecedented changes in all aspects of society, the IPCC said in a new assessment. With clear benefits to people and natural ecosystems, limiting global warming to 1.50C compared to 20C could go hand in hand with ensuring a more sustainable and equitable society, the Intergovernmental Panel on Climate Change (IPCC) said on Monday. The Special Report on Global Warming of 1.50C was approved by the IPCC on Saturday in Incheon, Republic of Korea. It will be a key scientific input into the Katowice Climate Change Conference in Poland in December, when governments review the Paris Agreement to tackle climate change. "With more than 6,000 scientific references cited and the dedicated contribution of thousands of expert and government reviewers worldwide, this important report testifies to the breadth and policy relevance of the IPCC," said Hoesung Lee, Chair of the IPCC. Ninety-one authors and review editors from 40 countries prepared the IPCC report in response to an invitation from the United Nations Framework Convention on Climate Change (UNFCCC) when it adopted the Paris Agreement in 2015. The report's full name is Global Warming of 1.50C, an IPCC special report on the impacts of global warming of 1.50C above pre-industrial levels and related global greenhouse gas emission pathways, in the context of strengthening the global response to the threat of climate change, sustainable development, and efforts to eradicate poverty. "One of the key messages that comes out very strongly from this report is that we are already seeing the consequences of 10C of global warming through more extreme weather, rising sea levels and diminishing Arctic sea ice, among other changes," said Panmao Zhai, Co-Chair of IPCC Working Group I. The report highlights a number of climate change impacts that could be avoided by limiting global warming to 1.50C C compared to 20C, or more. For instance, by 2100, global sea level rise would be 10 cm lower with global warming of 1.50C C compared with 20C . The likelihood of an Arctic Ocean free of sea ice in summer would be once per century with global warming of 1.50C , compared with at least once per decade with 20C. Coral reefs would decline by 70-90 percent with global warming of 1.50C , whereas virtually all (> 99 percent) would be lost with 20C. 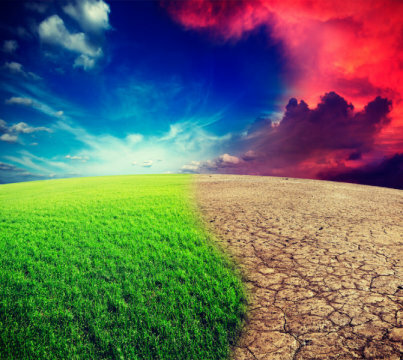 "Every extra bit of warming matters, especially since warming of 1.50C or higher increases the risk associated with long-lasting or irreversible changes, such as the loss of some ecosystems," said Hans-Otto Portner, Co-Chair of IPCC Working Group II. Limiting global warming would also give people and ecosystems more room to adapt and remain below relevant risk thresholds, added Portner. The report also examines pathways available to limit warming to 1.50C , what it would take to achieve them and what the consequences could be. "The good news is that some of the kinds of actions that would be needed to limit global warming to 1.50C are already underway around the world, but they would need to accelerate," said Valerie Masson-Delmotte, Co-Chair of Working Group I. The report finds that limiting global warming to 1.50C would require "rapid and far-reaching" transitions in land, energy, industry, buildings, transport, and cities. Global net human-caused emissions of carbon dioxide (CO2) would need to fall by about 45 percent from 2010 levels by 2030, reaching 'net zero' around 2050. This means that any remaining emissions would need to be balanced by removing CO2 from the air. "Limiting warming to 1.50C is possible within the laws of chemistry and physics but doing so would require unprecedented changes," said Jim Skea, Co-Chair of IPCC Working Group III. Allowing the global temperature to temporarily exceed or 'overshoot' 1.50C would mean a greater reliance on techniques that remove CO2 from the air to return global temperature to below 1.50C by 2100. The effectiveness of such techniques are unproven at large scale and some may carry significant risks for sustainable development, the report notes.